While cracking the password, attacker always needs an wordlist. Normally, wordlist use thousand of words per second to crack the password. If attacker gathers some information about the victim like – birthday dates, children names, pets name, girlfriend name etc. Attacker can use information in creating of the custom wordlist. While attacking on any organisation we might need an custom wordlist, to generate the wordlist for attacking. Thats why crunch is used. 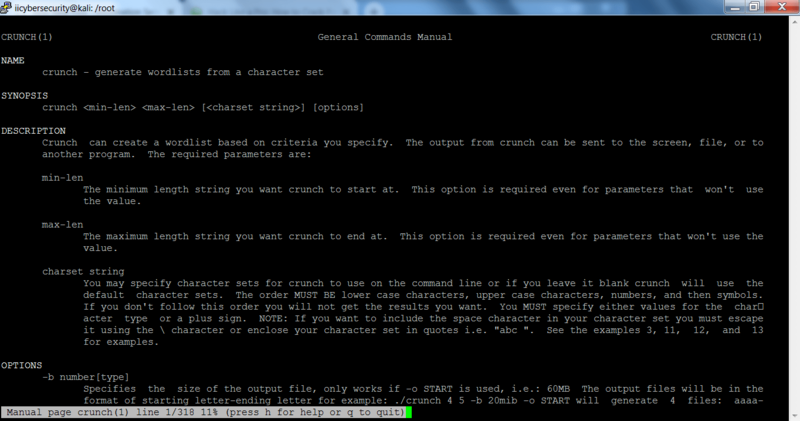 Crunch is an inbuilt tool from Kali Linux. 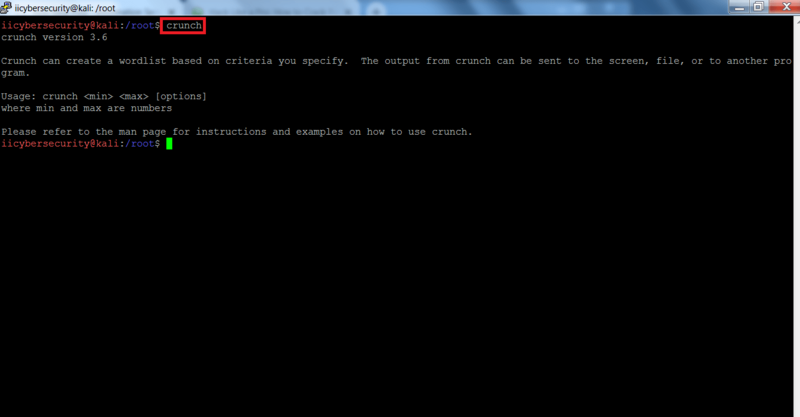 Crunch helps in creating an custom wordlist. And that wordlist can be used in John The Ripper, Cain And Abel, Aircrack-ng and many more password cracking tools. Ethical hacking researcher of iicybersecurity says that crunch is mostly used in mass level of attacking on login webpages of popular social media platforms as well as on big tech companies. 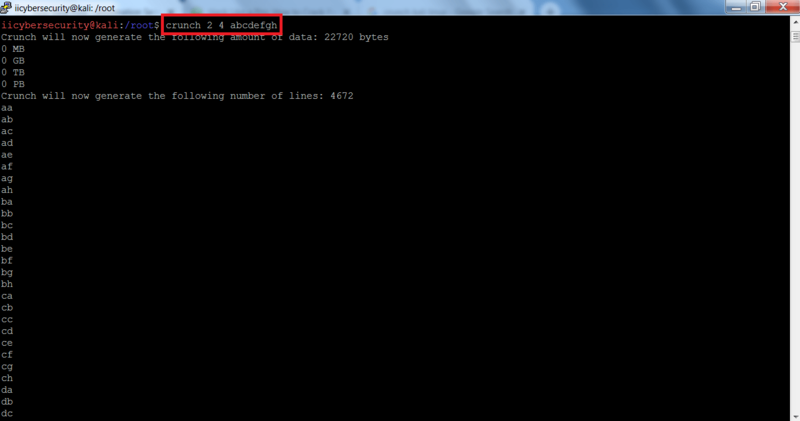 You can also specifiy the numbers or the characters in wordlist. If you specify the character the wordlist will generate in characters and if you specify the numbers the wordlist will generate in numbers as shown below. Here wordlist will be generated in characters. 2 is the minimum password length and 4 is the maximum password length. abcdefgh characters are used to generate the list. You can also use the numbers to generate the wordlist. 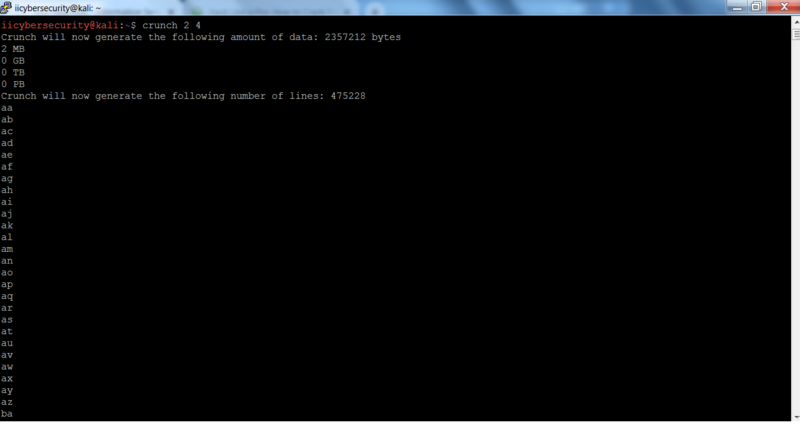 Here wordlist will be generated in numbers. 123456789 numbers are used to generate the list. The above screen shots are the manual pages of the crunch. These manual pages can be used in knowing the options of crunch command. We are assuming that the target having password between 2 and the 4 characters. So the crunch will make wordlist between 2 to 4 character. 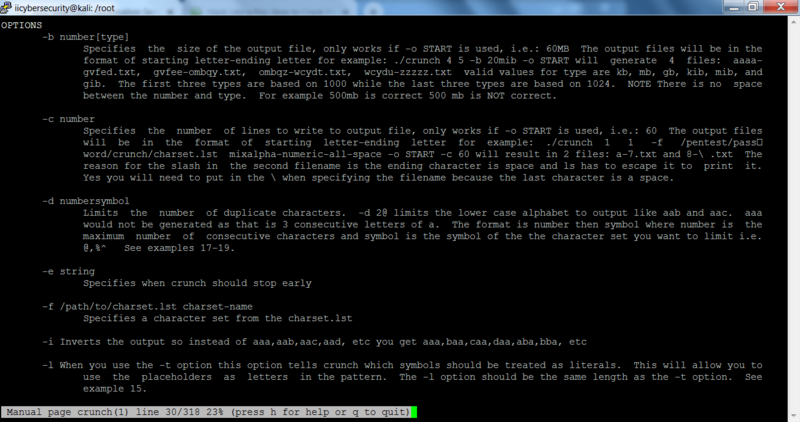 Type crunch 2 4 in linux terminal. As you can see that the crunch has started to make the wordlist. Notice one thing that wordlist has been created between 2 to 4 characters. You can use the above wordlist for cracking the password. 9875347821 are the numbers used to generate the list. 10 is the minimum password length and next 10 is the maximum password length in the above command. -o /path/to/save/list is used to specify the location to save the wordlist. After executing the above command crunch will generate the password list using the numbers <9875347821>. The above numeric list could be used if the attacker knows the mobile number of the target. It could be an possibility that password must be an mobile number. -i is used to inverts the output. This options inverts the output generated without -i option. If we don’t use -i, crunch will generate list in aa, ab, ac, ad, ae but if you use -i, crunch will generate list in aa, ba, ca, da, ea as shown below. abcdefgh are the characters used in generating list. 1 is the minimum password length and 2 is the maximum password length in the above command. The above output is inverting the output generated without -i option. <@> insert lower case characters. 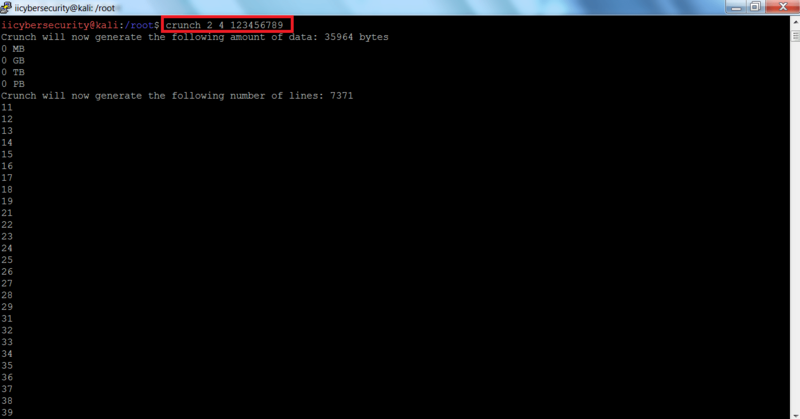 10 is the minimum and next 10 is the maximum password length in the above command. -o /path/to/save/list is used to save the list. Here 0316 is the birth date used for generating the list. As on assumption we can take that target can have password on the birthday dates. So we can generate the wordlist on the birth dates. As you can see the above list has been generated using the particular birthday date. The above information can be used in password cracking. 0316 use as birthday dates to generate list. After the executing the above command, query will generate the wordlist in uppercase letter. <%> is used to generate numbers. 0618 use as birthday dates to generate list. -o is used to save the path of the list. The above output can be used in password cracking. Crunch provides a feature where you can generate a list using a specific character set. If you know that your target is using the password of 7 alphanumeric characters. You can generate a list of the possibilities in crunch. For using the charset first select the charset. You can use any of the char set value to generate the list. For showing you we have select ualpha to generate the list. 8 is the minimum number of password length and next 8 is the maximum number of password length. /usr/share/crunch/charset.lst ualpha will be used particular charset to generate the list. -f to use the charset.lst in order create crunch. After executing the above command, crunch has generated the list which can be used in mass level of attacks.